Why do Germans hate the ECB? The Germans hate the ECB. Indeed just a cursory look at the two extremes of German journalism, the plebeian Bild and the aristocratic Frankfurter Algemeine Zeitung, shows a dislike for the ECB just as intense as the like for the Bundesbank. The criticism is not unanimous 1)A notable exception to the German ECB bashing is a thoughtful recent article in the Frankfurter Allgemeine Zeitung: “Kritik an Draghi ist noch keine Lösung. Die Kritik an der Europäischen Zentralbank ist groß. Aber sieben prominente Ökonomen fragen: Wo bleibt die konstruktive Antwort auf die Krise Europas?” signed by Marcel Fratzscher, Reint Gropp, Hans-Helmut Kotz, Jan Krahnen, Christian Odendahl, Beatrice Weder di Mauro, Guntram Wolff. but is overwhelming. The recent, interesting interview by Weidmann, in which he delivered a somewhat surprising defence of the ECB, must be seen against this background. That interview is, in my view, the sign of a truce between Draghi and Weidman. I do not mean there is necessarily an explicit Draghi-Weidmann deal, but there are objective conditions for a truce between hawks and doves. On one hand, as I mentioned in a previous post 2) Frankfurt impressions and as confirmed in the last press conference, the ECB feels that it has imparted a substantial dose of monetary stimulus into the economy and now it has to wait and see what the effects are before of thinking of doing anything more. As a consequence, Weidmann is somewhat reassured that there is not a new wave of ECB activism coming. On the other hand, Draghi must welcome a sign of support coming from an arch-hawk. In my view, further evidence of a truce is the fact that there is not much trace of vocal opposition to the March measures in the most recent monetary policy account (the strongest sign of opposition is a bland: “……a few members restated their reservations…”). Draghi even gave a sign of further rapprochement when he mentioned, at the latest press conference, that the Governing Council is unanimously of the view that the current policy stance is adequate. 3) This morning we had a brief discussion on this issue, and I can report to you that the Governing Council was unanimous in defending the independence of the European Central Bank and the appropriateness of the current monetary policy stance. Maybe the truce between hawks and doves extends beyond the axis between Sonnemannstraße (seat of the ECB) and Wilhelm-Epsteinstrasße (seat of the Bundesbank). The turnaround of Schäuble, who corrected his strident criticism of the ECB with much softer sentences 4)The initial criticism was on a Reuters article: Schaeuble vs Draghi, by Noah Barkin of April 10, 2016 in which Schäuble was quoted as saying: “I said to Mario Draghi…be very proud: you the can attribute 50% of the results of a party that seems to be new and successful in Germany to the design of this [monetary] policy.”. The back-tracking came a few days later as reported in an article in Politico of April 18th „Behind Wolfgang Schäuble’s attack on the ECB”, by Matthew Karnitschnig. (after a suggestion from the always guarded Kanzlerin?) may be the sign of a wider truce. The truce is not likely, though, to have a permanent quelling effect on the criticism of the ECB by the Germans. There must be a reason for the Germans´ negative attitude towards the ECB just matched in intensity by the opposite positive attitude towards the Bundesbank. This reason, though, remains mysterious to me. The only thing I know is that it cannot possibly have anything to do with inflation control. Indeed the two central banks were given the same objective: price stability, translated into a more precise target, keeping inflation below but close to 2.0%. The fact is that the ECB has, so far, achieved this objective better than the Bundesbank. 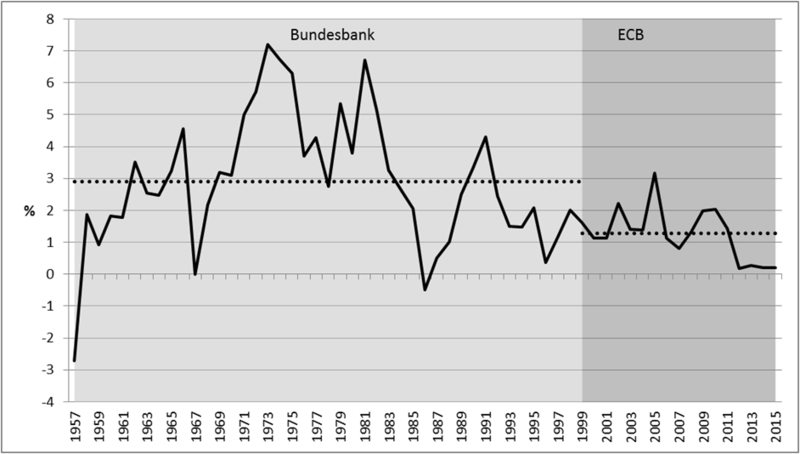 This is visible in the chart below, reporting the rate of inflation in Germany between 1957, when the Bundesbank was created, until the end of 1998, when monetary policy was entrusted to the ECB and then from 1999 to now. The first horizontal line reports the average rate of inflation achieved by the Bundesbank when it was deciding on monetary policy. The second horizontal line reports the average rate of inflation in Germany achieved by the ECB. The average rate of inflation in the ECB time is about a half of that in the Bundesbank time. The comparison between the inflation performance of the two central banks should take into account the fact that the Bundesbank carried out its monetary policy task for much longer than the ECB so far and thus the sample of the ECB is shorter and could be affected by special factors: the ECB may have achieved a good inflation control just because it was lucky. Chart 2 reports the 18 years moving average of the German rate of inflation in the Bundesbank and in the ECB periods. The length of the moving average is of course chosen to match the time over which the ECB carried out monetary policy, thus there is only one observation for the ECB and 25 in the case of the Bundesbank (42 years of Bundesbank monetary control – 17 years observations to have the long moving average). In the chart one sees that the ECB has done better in its 18 years of existence than the Bundesbank in any of the 18 year periods in which it controlled inflation in Germany. In some periods stretching 18 years, inflation in Germany was on average higher than 4.0 per cent and in no 18 years period was it lower than 2%. So, in conclusion, two institutions, the Bundesbank and the ECB, were created and given the same objective. One discharged its responsibility better than the other, but is also utterly disliked by the Germans, that instead like the other one a lot. To find the reason, one may have to look in the mysterious area of social psychology more than in the arid field of economics. The reason why the Germans hate the ECB is mysterious but the fact is real and the question is whether the antagonism of the Germans towards the ECB could have, if sustained, negative consequences: after all Germany is the leading country in the €-area, the ECB was modelled on the successful example of the Bundesbank and a lack of support from German public opinion could have negative consequences 5)John Nugee made this point forcefully to me in a comment to a post of mine: Frankfurt impressions . 4. When the ECB will manage to get out of its “unconventional” measures the hostility should subside. While these factors attenuate the problem they definitely not eliminate it. I just hope that they will help to keep the issue under control for a while longer. This post was written with the assistance of Piero Esposito. 1. ↩ A notable exception to the German ECB bashing is a thoughtful recent article in the Frankfurter Allgemeine Zeitung: “Kritik an Draghi ist noch keine Lösung. Die Kritik an der Europäischen Zentralbank ist groß. Aber sieben prominente Ökonomen fragen: Wo bleibt die konstruktive Antwort auf die Krise Europas?” signed by Marcel Fratzscher, Reint Gropp, Hans-Helmut Kotz, Jan Krahnen, Christian Odendahl, Beatrice Weder di Mauro, Guntram Wolff. 3. ↩ This morning we had a brief discussion on this issue, and I can report to you that the Governing Council was unanimous in defending the independence of the European Central Bank and the appropriateness of the current monetary policy stance. 4. ↩ The initial criticism was on a Reuters article: Schaeuble vs Draghi, by Noah Barkin of April 10, 2016 in which Schäuble was quoted as saying: “I said to Mario Draghi…be very proud: you the can attribute 50% of the results of a party that seems to be new and successful in Germany to the design of this [monetary] policy.”. The back-tracking came a few days later as reported in an article in Politico of April 18th „Behind Wolfgang Schäuble’s attack on the ECB”, by Matthew Karnitschnig. Next: Until when will the US and the €-area be awash with central bank liquidity?